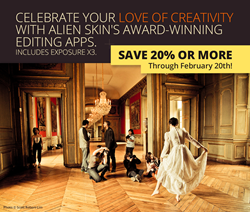 Save 20% or more on all products during the Alien Skin Software winter sale. Alien Skin Software today announced the beginning of its winter sale. Customers can enjoy savings of 20% or more on all products in its store today through February 20th. The featured product is Exposure X3, their advanced non-destructive RAW photo editor. Photographers can use it to quickly organize, edit, enhance, and export their photos. Exposure’s design encourages a creative and intuitive workflow, while eliminating subscriptions and unnecessary complexity. From capture to creativity, Exposure is the fastest way for photographers to bring their vision to life. Alien Skin will also be releasing a significant update to Exposure X3 next month, which they will announce soon. This update will be free for all owners of Exposure X3. Alien Skin Software makes creative tools for photographers and graphic designers. The company distills advanced math and cutting edge research into creative tools that help you quickly bring your vision to life. Alien Skin Software’s reputation for bug-free software and friendly tech support has grown worldwide since its founding in 1993. For more information, visit the Alien Skin website at http://www.alienskin.com. Exposure, Snap Art, Bokeh, Blow Up, Alien Skin Software, and the Alien Skin Software logo are registered trademarks of Alien Skin Software, LLC. All other trademarks are the property of their respective owners.